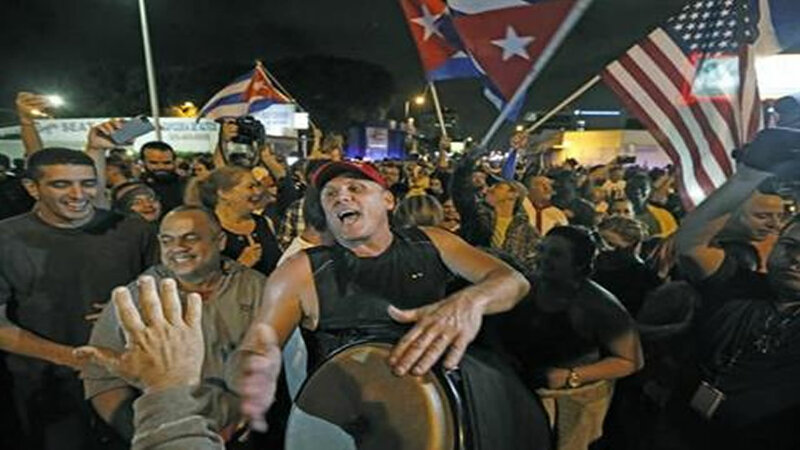 HAVANA (KGO) -- Within half an hour of the Cuban government's official announcement that former President Fidel Castro had died, Miami's Little Havana teemed with life - and cheers. Thousands of people banged pots with spoons, waved Cuban flags in the air and whooped in jubilation on Calle Ocho - 8th Street, and the heart of the neighborhood - early Saturday. Honking and strains of salsa music from car stereos echoed against stucco buildings, and fireworks lit up the humid night sky. Police blocked off streets leading to Cafe Versailles, the quintessential Cuban American hotspot where strong cafecitos - sweetened espresso - were as common as a harsh word about Fidel Castro. "Cuba si! Castro no!" they chanted, while others screamed "Cuba libre!" Celebration, not grief, permeated the atmosphere. That was no surprise. Castro has cast a shadow over Miami for decades, and in many ways, his policy and his power have shaped the city and its inhabitants. There were no reports of violence or any arrests during the demonstrations, Miami police spokeswoman Kenia Fallat said Saturday. Miami-Dade County officials said there were no plans to activate the emergency operations center - another sign of the more subdued reaction to Castro's death than might have previously been expected. "They are celebrating but in a very peaceful way," Fallat said of the demonstrators. Cubans fled the island to Miami, Tampa, New Jersey and elsewhere after Castro took power in 1959. Some were loyalists of Fulgencio Batista, the president prior to Castro, while others left with the hope they would be able to return soon, after Castro was toppled. He never was. Many others believed they would not be truly free under Castro and his communist regime. Thousands left behind their possessions, loved ones, and hard-earned educations and businesses, traveling to the U.S. by plane, boat or raft. Many Cubans died on the ocean trip to South Florida. And many never returned to see their childhood homes, their neighborhoods, their playgrounds, their businesses, their cousins and aunts and uncles, because Castro was still in power. The ones that made it to Miami took a largely, and vehemently, anti-Castro stance. On New Year's Eve every year, Cubans in Miami utter a toast in Spanish as they hoist glasses of liquor: "Next year in Cuba." But as the Cuban exiles aged, and as Castro outlived them, and as U.S. President Barack Obama eroded the embargo and younger Cubans returned to the island, the toast rang silent in many households. In Miami, where Havana is closer both geographically and psychologically than Washington, the news of Castro's death was long anticipated by the exiles who left after Castro took power, and in the decades since. Rumors have come and gone for decades, and Castro's death had become something of a joke - mostly because it seemed to happen so frequently. This time, though, it was real. "We're all celebrating, this is like a carnival," said 72-year-old Jay Fernandez, who came to Miami when he was 18 in 1961. He and his wife and another woman held up a bilingual sign he'd made four years ago when Castro first became ill. "Satan, Fidel is now yours. Give him what he deserves. Don't let him rest in peace." Several blocks away, at the Bay of Pigs memorial, Antonio Hernandez, 76, rode his bicycle up in a light rain and stood at the eternal flame that honors the men who tried, and failed, to wrest Cuba from Castro's grip in 1961. "Everybody's happy. Now this guy won't do any more damage," said Hernandez, who came to Miami on the Mariel boat lift in 1980. "His brother will now go down, too. But the world has to pay attention to this, not just we Cubans." Wrote Valentin Prieto, a prominent Cuban-American blogger, on Facebook: "A few hours of sleep tonight is the very last thing fidel castro will ever rob me of." In his writings on his blog, Prieto never capitalized Castro's name. Many Cubans made successful livings and raised families in Miami despite having to learn a new language and start their lives over. Exiles who arrived as teenagers with no money in their pockets became millionaires, political leaders, clergy members, teachers - influential members contributing to the sturdy fabric of American society. Cemeteries in South Florida abound with the remains of those who fiercely wished Castro had died before them. Their children weep today because they could not see their parents and grandparents return to Cuba under a democratic regime, to see their homeland one more time. Gabriel Morales, a 40-year-old financial executive, monitored social media early Saturday from his home in Miami. His parents both left Cuba decades ago. His father left Cuba before Castro took over, and then returned to visit during Castro's regime. He vowed never to return until the regime changed, Morales said. Morales' mother left after Castro assumed power; her family had their property appropriated by the government, Morales said. "Feels weird," Morales said in a text message to an Associated Press reporter. "Been waiting to hear this news all my life. Seems unreal."